At Wornick, we develop our students to be resilient and responsible leaders whose actions are rooted in Jewish ethics and values, that nourish their minds and souls. Our mission is to further our culture of giving, better our world, and build a welcoming community of diverse learners. 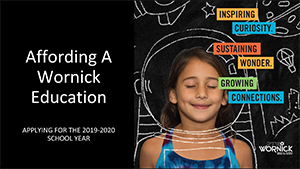 We are committed to making the Wornick education and experience accessible to a broad range of families with a wide variety of economic circumstances. Wornick is proud to be able to offer Tuition Assistance to families who would otherwise be unable to pay full tuition, and is committed to supporting socioeconomic diversity in our community. Awards are based solely upon a family’s demonstrated need. The school encourages families who have a need for assistance to apply. In determining the extent of a family’s need, the school expects families to pay what they are able, but also takes into account all factors affecting the family’s financial resources. Wornick, like many other independent schools, uses the online Financial Aid for School Tuition (FAST) Program powered by Independent School Management as a tool to help effectively determine each family’s needs. All information from FAST is kept confidential, as is all information pertaining to a family's aid request. Current and new families file a FAST financial analysis application by February 11, 2019. Tuition Assistance letters will be emailed to current families and new siblings on March 4, 2019, and emailed to new families with admission decision letters on March 21, 2019. Award letters from returning families are due March 11, 2019, and for new families are due along with enrollment contracts and deposits on March 28, 2019. Awards are decided anonymously by a committee comprised of finance professionals and community members. Awards are based solely upon a family’s financial resources. Assistance requests submitted after the deadline of February 11, 2019 will be considered on the basis of remaining funds available. To ease the FAST online application process, you may begin an application, save it and go back to it at a later time. FAST provides a 24/7 help desk to answer all application questions. As part of the application process, FAST performs an income verification. You must use the online self-guided FAST application, and then you will mail tax and other related financial documents to FAST. FAST increases the efficiency of the application process by converting your submitted tax documents into electronic format. After completing an online application, you will receive an email from FAST with a list of documents to mail. Please be prepared to submit your 2018 Federal Tax returns, 2018 W-2s, 2018 1099s and your most current pay stubs. Please mail these documents to the FAST address below. Please do not send any originals, and do not fax or email any documents. The Tuition Assistance Committee will meet in February to review applications from both current Wornick families and new families. Families will be notified of the Tuition Assistance determination at the time they receive notification regarding the student’s admission status. Notifications to current families will be emailed on March 4, 2019. Notifications to new families will be mailed on March 20, 2019 and emailed on March 21, 2019. For all application process questions, please contact FAST directly at help@ismfast.com or by phone at 1-877-326-FAST. General questions regarding Tuition Assistance at Wornick can be directed to the Tuition Assistance Committee through the Admissions Director or sent to the Committee directly in writing to: Tuition Assistance Committee, ℅ Admissions Director, Ronald C. Wornick Jewish Day School, 800 Foster City Blvd., Foster City, CA 94404. Does applying for Tuition Assistance affect admission decisions? No, the determination of tuition levels is independent from the admission process and does not influence admission decisions. Who is involved in the application review process? The applications are first evaluated by an online program, Financial Aid for School Tuition (FAST), powered by Independent School Management. Then an independent committee (not current parents) will review the FAST award recommendations and decide on final award amounts. Is there a multiple child discount? Wornick’s tuition assistance is based on a family’s demonstrated financial need. The cost of sending multiple children to Wornick is taken into consideration when calculating the tuition assistance award. What if our financial statement doesn't fully explain our family's need? The FAST application provides an opportunity to fully explain any circumstances or obligations that impact your household's finances. If I receive a tuition assistance award can I rely on receiving the same award in subsequent years? Wornick's commitment is to make every effort to keep your family's tuition assistance award at a similar proportional level to tuition in subsequent years. However, should the school's budget or your family's financial resources materially change, that ratio may be adjusted. Wornick requires every family to fill out the FAST application every year.